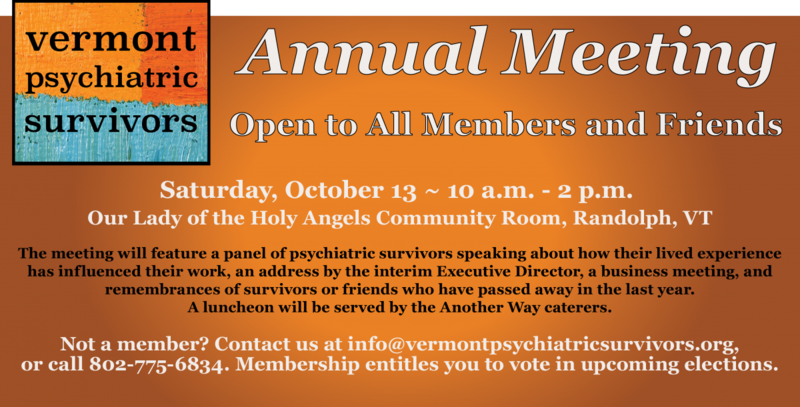 Join us for our 2018 Annual Meeting | Vermont Psychiatric Survivors, Inc.
Join Vermont Psychiatric Survivors for our Annual Meeting, open to all members and friends. The meeting will take place on Saturday October 13, from 10 AM to 2 PM in the Community Room of Our Lady of the Holy Angels in Randolph, VT. The meeting will feature a panel of psychiatric survivors speaking about how their lived experience has influenced their work. A luncheon will be served by the Another Way caterers. Not a member? Contact us at [email protected], or call 802-775-6834. Membership entitles you to vote in upcoming elections. Please RSVP by emailing [email protected]vermontpsychiatricsurvivors.org or calling (802) 775-6834, and leaving the name of the party and how many will be in your party.